The Poitou-Charentes area of western France is not a historic region of France, but was formed in 1956 from the major part of the old Poitou area, plus three smaller areas in the south. Until 2015 it was a region. Now it is part of the large region of southwest France known as Nouvelle Aquitaine. The climate of the Charentes is one of the mildest in France, and the coastal area of this region is the sunniest part of France outside the Mediterranean coastal areas. In brief, the region covers the central part of France's Atlantic coastal plain, together with a gently undulating hilly area further inland, the first foothills of the Massif Central. In the southern part of the region, extensive vineyards provide the grapes that are used in the production of Cognac and the famous local apéritif wine Pineau des Charentes. In the north of the area, the departments of Deux Sèvres (79) and Vienne (86) make up the historic Poitou region, centered on the ancient city of Poitiers; the southern part of the area comprises the low-lying departments of Charente (16) and Charente- Maritime (17). 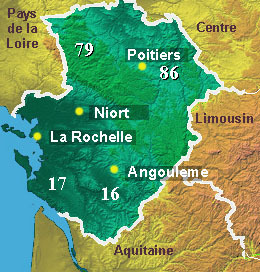 The whole region is largely rural, and even the regional capital Poitiers has less than 100,000 inhabitants. Niort, capital of the Deux Sèvres department, is specialised in financial services, notably insurance, and mail-order, which is surprising for a town of just 60,000 inhabitants; however the town was hit hard in 2008 by the collapse of the CAMIF, one of France's big mail order cooperatives, and by the financial crisis in general. The regional council has tried hard to develop the regional economy; the creation of the Futuroscope theme park, just north of Poitiers, opened in 1986, was designed to give an economic boost to the region; but though it has generally been a successful tourist venture, and is one of the twenty most visited attractions in France with an average of over 1.5 million visitors a year, it has not transformed Poitiers into one of France's major cities, and many of those who visit the Futuroscope, located beside the A10 motorway, are just passing through on their way to the coast, or further south. 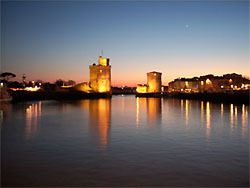 The coastal area, including the towns of La Rochelle, Rochefort and Royan, is popular for seaside tourism and also with yachtsmen; there are plenty of long sazndy beaches, however many kilometres of the coastline are given over to oyster beds, oysters being one of the big local specialities. 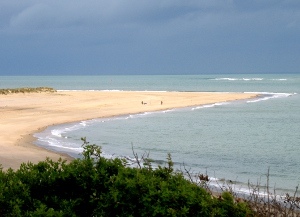 The coastal islands of Oléron and Ile de Ré are famous for their beaches and maritime environment. Some parts of the coastal area lie at or even marginally below sea-level; in Spring 2010, high tides and heavy seas pushed by hurricane Xyntia broke through the sea defences causing serious flooding. As a result of this, some 1500 houses in the Charente Maritime and Vendée departments are to be demolished. Le Marais Poitevin - Venise verte. "Green Venice" covers much of the sea-level flat land inland from the coast, mostly in Deux Sèvres and Charente maritime. It is an area of slow moving rivers and channels, woods and fields. Boating and kayaking, angling, rambling and riding are among popular activities here. There is a good network of marked cycle tracks and the area is a haven for wildlife. Angoulème (16) Attractive hill town, with an old but not particularly historic town centre. The cathedral, of romanesque origin, was extensively renovated in the 19th century. Aubeterre sur Dronne: (16) small town with unusual romanesque "monolithic" church, carved out of the rock. One of the "most beautiful villages in France" - consequently full of tourists in busy periods. Cognac (16) Visit the great cognac houses, and the cognac and pineau cellars. Brouage; the citadel (17). Remarkable 17th century walled garrison town, birthplace of Samuel de Champlain, the founder of Quebec. Once a major Atlantic port, Brouage was abandoned, and survived just as a village on the Charentes fenlands. Off the beaten track, it has remained virtually unchanged, its fortifications rising from the marshes. La Rochelle (17); historic Altlantic port city, with medieval fortifications around the old port. The Aquarium at la Rochelle is one of the 20 most visited attractions in France. La Rochelle, which prides itself as the yacht-building capital of France, also has a maritime museum on board a historic ship. Rochefort (17). Small city just inland from the coast, once a major naval arsenal. Old naval buildings, including the old naval rope works, and the Maritime museum, with historic collection of model sailing ships, and a shipyard where a replica 18th century frigate, the Hermione, was recently built. Other interesting attractions include France's only surviving transporter bridge (no longer in use), and the unusual House of Pierre Loti, a French 19th century traveller, with its genuine Oriental interiors; and the Museum of historic shops.... a trip down memory lane for more elderly visitors. Royan (17) : classic seaside resort. The la Palmyre zoo is one of the best in France. Jardins du Monde offers a discovery of garden styles from round the world, plus a butterfly house. Saintes (17). Lying on the river Charente, Saintes was once the capital of the Roman province of Aquitaine. Today a small town, it is most famous for the Roman triumphal arch (Arch of Germanicus) and remains of the Roman amphitheatre and other remains from antiquity. The historic Abbaye aux Dames is the largest example of Saintonge romanesque architecture. Saujon (17). Train des Mouettes - the Seagull line - 21 Km from Saujon (between Royan and Saintes) to la Tremblade, along the estuary of the Seudre. Steam trains on weekdays in the holiday period. 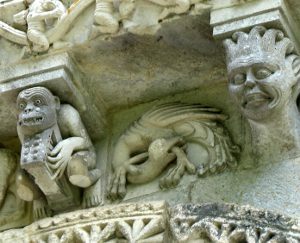 Saintonge: (17) a remarkable ensemble of 11th and 12th century romanesque churches, with magnificent carved porches and stonework. So many villages harbour marvels of medieval heritage, that sometimes they are not even signposted. 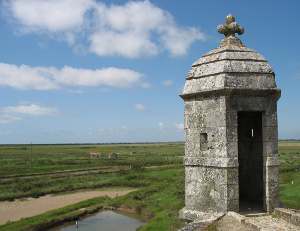 Iles de Ré and Oléron - Popular offshore islands, accessible via road bridges from the mainland. Niort (79). The capital of the Deux-Sèvres department is a classic old French town. Though the outskirts are modern - Niort is home to the major French insurance cooperatives or "Mutuelles" - the old town is a sleepy ensemble of stone buildings dominated by a medieval castle overlooking the river Sèvre Niortaise . Parthenay (79) . Small town on the river Thouet, best known for its impressive medieval fortified bridge. Chauvigny (86) the town of the five castles. Five impressive castles and a romanesque church make up the medieval quarter of this old town built on a rocky spur beside the river Vienne, just east of Poitiers. Poitiers (86), Regional capital, Poitiers is an old hill-town with an attractive old centre. 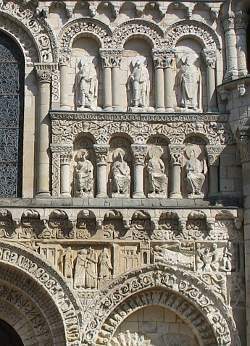 The city is most famous for its ancient churches, including the medieval frescoes in St. John's Baptistry, reputedly the oldest place of Christian worship in France, and the Notre-Dame la Grande church, one of the most famous and distinctive romanesque churches in France. Romagne (86) Near the Futuroscope. Valley of the Monkeys - Vallée des Singes - Over 400 primates from tiny ouistitis to large gorillas live on this 35 acre wildlife park. No cages, no fences. The animals live in semi-liberty on islands, some of them accessible to visitors, others clearly visible. St Savin sur Gartempe (86). UNESCO world heritage site, a romanesque abbey church with a remarkable collection of medieval frescoes. By train (TGV) from Paris Gare Montparnasse or Gare d'Austerlitz. Access by road from the UK, via any of the Channel ports, then via Paris or via Rouen. The Poitou-Charentes region is crossed by the main motorway between Paris and western / southwestern France, the A10 (Paris-Tours-Bordeaux). Poitou-Charentes has a network of good regional roads, and also a rail network connecting most towns. The coastal area of Poitou-Charentes is reputed to be one of the sunniest regions of France; the whole Poitou-Charentes area benefits from a mild Atlantic climate. 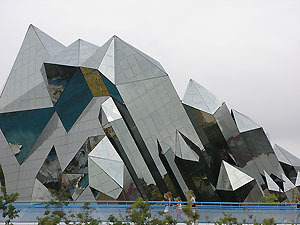 Photos: © About-France.com except when otherwise indicated.